This is part three of my series of posts on the operational use of UAVs for SAR. The first post was on the basics of UAV use in Canada, and the second was on how SAR works in BC for UAV operators. This post will deal with some scenarios for how a UAV could be used for SAR. This post has been a long time coming, partially because I keep thinking and revising my opinion on how UAVs could be used. In a post I wrote three years back but ultimately did not publish, I originally came down on the side of “UAVs have limited use for SAR”. In the intervening years I’ve talked to many operators, other SAR groups, hobbyists, Transport Canada officials, and manufacturers. I’ve given talks, written articles, arranged demos, organized and spoke at round tables, and appeared on TV, radio and in print many times (including this week) outlining how I now believe that UAVs will eventually save lives, and make SAR more efficient and safer. The following scenarios are partly based on my current understanding of UAV capabilities. Since there are continuous changes in technology, and legal and regulatory requirements might change, this post might feel dated very quickly, but it’s worth a shot. 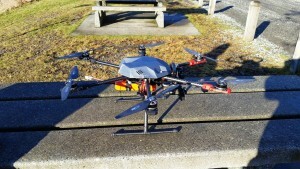 a UAV from Kaizen Kinetics Inc. The basic use of a UAV is to provide an eye in the sky. SAR teams in BC use helicopters to look for missing people (despite the fact that the official policy on the use of helicopters is only for the transportation of people and equipment). Any time you consider using a helicopter, you could consider using a UAV. As I’ve said many times, I don’t believe a UAV is an appropriate replacement for a helicopter. Consider using a UAV when a helicopter is not available, or cannot fly. In BC there are many occasions where this is likely – at night and when the airport is fogged in (as it was for a recent search in North Vancouver). A UAV has a very short range when compared to a helicopter. A camera on a UAV has a a tiny resolution when compared to a human eye. While it isn’t a replacement, it is better than no information at all. The second most basic use of a UAV is to confirm information you think you know. In many cases a person will report their location by phone other other methods. A UAV can fly to a very high probability area and confirm that the subject is there. As a SAR Manager this would drastically change my approach to a rescue as I could concentrate all resources on that one area rather than keeping people in reserve, or covering off contingent areas. This would lead to a safer, faster rescue. This scenario happens multiple times a year in the Metro Vancouver area; lost people frequently call in by phone to ask for help, and often know the general area they’re in. We use tools like YourLo.ca/tion and other techniques to narrow down where they are. A UAV would be a nice addition to those tools. This scenario relies on the UAV being able to carry a very small payload. In many occasions we locate the subject but it can take quite a while to get to them. In the mean time we would like to communicate with them, and perhaps send them a few pieces of equipment to keep them comfortable. I have personally stuffed jackets, food, water and a radio into a bag, and dropped it from a helicopter, and my team keeps a “drop kit” for his purpose. A properly designed UAV should be able to carry a radio, or a water bottle, or a small blanket and some food. There would be quite a high value to this on certain situations, notable when the subject is in an inaccessible area such as a cliff. In my opinion, it is possible but unlikely that a UAV would be able to locate a subject alone. I’ve been involved in SAR for a long time and helicopters find people rarely – in fact it’s possible to fly over someone all day and not see them in thick canopy and bush. A UAV, with a smaller field of view, lower resolution, and short flight times, is not the first tool I would think of when deciding to look for someone. As technology changes and we get access to larger UAVs, more capable cameras etc, this could change and it could make more sense to use a UAV for general searching. The following scenarios revolve around weather, time of day or terrain conditions where a UAV is more advantageous to other approaches. A UAV can be used to search in terrain that is hazardous to put a person into. In a recent search I was standing on the top of a deep gorge where I could not see the bottom because of debris, plants, and an overhang, The gorge was approximately 300 feet deep, longer than any ropes I had with me. There were no suitable anchors, and the edge of the cliff had a lot of loose debris. This scenario would be perfect for a UAV. The gorge was a high priority area, but not searchable within a reasonable margin of safety. However, a rotary wing UAV could have easily searched the area to a high level probability of detection. In the case of the search mentioned above, the gorge was not searched because it was not safe. Avalanche terrain is a sub-set of hazardous terrain. One of the most basic tents of safe travel in the backcountry is situational awareness. SAR members, unlike many backcountry travelers, are often approaching avalanche terrain in areas they may not be familiar with. Adding the ability to safely take a look ahead can give you an edge; just observing the shape of the terrain can help you make travel decisions to avoid obvious hazards. I wrote about other approaches a UAV can have to avalanche safety for the Avalanche Journal last year. As mentioned above, having a UAV in the air when you don’t have access to a helicopter makes sense in a number of conditions. If you have a high probability area and need to get some information, a UAV would be appropriate. Properly equipped helicopters and trained pilots can fly at night, but often those pilots have flown too many daylight hours (federal aviation regulations), so neither the helicopter or the pilot are available. Flying at night gives the opportunity to use Infra-Red (see below). Infra Red sensors, often called”FLIR” (Forward-Looking Infra Red) work well when the ambient temperature is lower than the temperature of a human body. This is mostly likely at night. The opportunities to use FLIR are quite rare in my experience as the RCMP helicopter in the lower mainland is seldom available. For standard searches, FLIR is probably the most valuable tool that could be used with a UAV. Light amplification is a way to multiply the effect of ambient light. Often called “night vision” this is standard technology for pilots to fly at night. Light amplification is a pre-requisite for flying a UAV at night. . This technique is not widely known to the public, and the cameras can be insaely expensive, having specialized software and file formats. A multispectral image is a photo or video composed of light from different wavelengths across the visual, ultra violet and infra red spectrum. Various materials look vastly different under different wavelengths of light, as anyone who has used a black light (near UV) can attest. Biologists use multispectral techniques to count caribou who are notoriously difficult to spot from aircraft. Mapping a search area with high resolution orthophotography would be useful for any search lasting longer than a day. This kind of thing requires special hardware and software and often hours to process the imagery. The benefit to the SAR management can not be over estimated as knowledge of terrain and conditions is very important to safety and search planning. This would only be useful for longer searches which are rare. Large fixed wing UAVS such as those at the UVic Centre for Aerospace Research are capable of very long flights over large areas. Some searches are just impossible to get people on the ground because the person went missing in a large area and there is no last known position. In these cases a long flight with video, multispectral and other sensors would be useful to cover a large area, in conjunction with traditional aircraft. Automated searching is currently not possible under Transport Canada rules which state that UAVs must be under control of a human operator. However, the portion of the search that can be automated is an analysis of the video taken during the flight. Having worked in the field of facial recognition, I’m very aware that there are many commercial grade motion and object recognition algorithms available that could contribute a lot to an automated analysis of video taken on a search. I would like to put out a challenge to any software companies with this technology; please consider donating it’s use to Search and Rescue as a part of your company’s charitable program. It would be an amazing way to publicize your capabilities. Contact me directly if you want to help. Consider for use when helicopter not available or not able to fly. Future: long range searching, automated searching. In a future post I will delve into the highly technical details of how a camera’s resolution works against you, and why most video taken from a helicopter is not useful in locating a missing person. I have many retorts to these comments, and I would like to respond without prejudice. It is clear that you have a great knowledge on Ground search and rescue techniques, but really lack in the realities of air search and rescue. I have over 15 years of experience in Air SAR and have accumulated a lot of experience in all sorts of weather and conditions. I realize that there is a lack of leadership in the discipline of short coupled air searches, as the fixed wing operators have no interest in small defined search area definitions. Rotory wing operators are experts on HETs and transport, and may have success on small areas of tricky terrain, but proven absolutely inefficient on anything larger than a few miles. This is hard for the non-air disciplines in SAR to imagine, as one would think that if you are in the air, with large windows, you can see everything. But you have admitted yourself, that rotary aircraft have flown by visible and low visible targets many times. Ground SAR members don’t know what they don’t know regarding air SAR. I believe, as you do, that there really is a defined roll for UAVs, rotary wing searches, and wide area fixed wing searches. These rolls should not be defined by Ground SAR who have limited Air SAR knowledge, but a combined agreement on the requirements, and resource capabilities involving all disciplines. I have discussed this issue with Major Jenn Weissenborn, officer in charge of the Joint Recue Coordination Center and she also agrees that this is a federal level issue, and needs to be addressed. I would like to meet with you soon to discuss an approach that we can assist in identifying the requirements of the province SAR interests, and try to bring a larger knowledge base together before we lose traction with unwarranted federal regulations. I agree with you Fred that Ground SAR “does not know what we don’t know” about air SAR. The goal of the first one is to avoid the hazard of personnel rappelling down creeks, streams and gullies, the goal of the second is to give us a FLIR; although we have access to Air 1, they are often unavailable to us. We’re talking very small UAVs with flight times in the 15-20 minute range. I’d love to meet to talk about this in person; I know there’s devices out there that can fly for hours and cover huge areas but I’m not hopeful that those would ever be made available to us, and f they did it would be have to be coordinated through the military, and would properly be part of CASARA or the air force’s responsibility. I totally agree. The real meaning of my rant, is that there is a lack of combined leadership to define the efficiencies and rolls of our air resources in the GSAR a environment. Something that’s been lacking for quite awhile, and that’s a chemistry for bad policies. And what the outcome of that meeting was given that it took place. Yes, Fred and I met; Fred’s with CASARA and is very knowledgeable. We met at the recent BCSARA conference in Richmond and did talk for more than an hour on this subject and air operations in general. I think the conclusion of that conversation is that we still have to play a bit of a waiting game on this as EMBC has not approved (or disapproved) UAVs for SAR operations. Air operations in general also need a big overhaul as Ground SAR uses Air Search in a very ad-hoc way, and we have no research to show what the probability of detection from a helicopter is in our terrain. The other outcome is that I explained to Fred that there’s a whole range of UAV operations that SAR can make use of immediately that take place within 100m range, and no more than 50m above ground level (AGL) — things like looking over cliffs and gorges, into crevasses, and flying low over creeks and rivers. By one interpretation and with a light enough unit, we don’t even need a permit for that scale. Still working on this among the many other projects I have on the go!